He started doing research. The result: “J-Town/Bronzeville,” a musical history in three movements composed by Iwataki, which first premiered in 2006 at the Getty Center and later at the Japanese American National Museum. This three-part suite was reprised before an appreciative, lively audience at Gardena Valley Japanese Cultural Institute on Nov. 4. 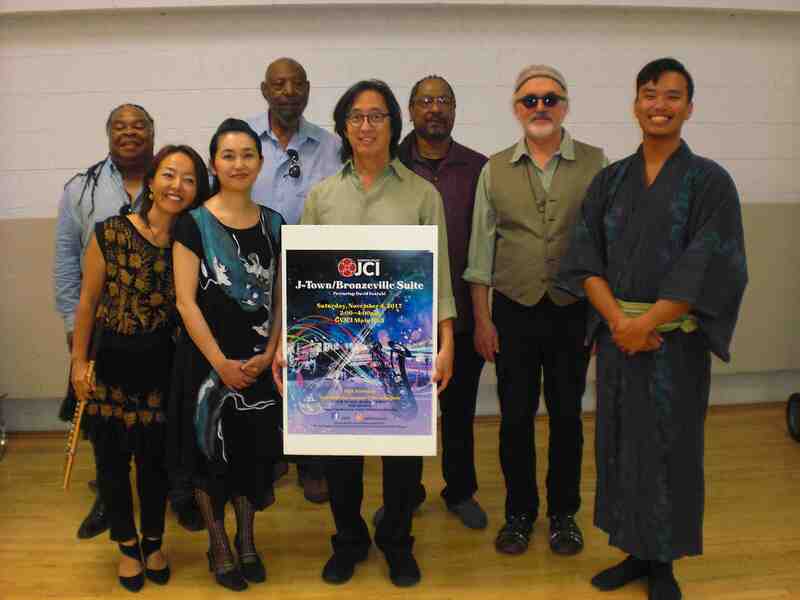 “As an aficionado of anything relating to the Japanese American internment era, Dave Iwataki’s 10-year reprise of his ‘J-Town/Bronzeville Suite’ at the Gardena JCI was amazing,” said Cory Shiozaki, director of “The Manzanar Fishing Club,” one of almost 200 attendees. The J-Town Ansanburu opened the first movement celebrating pre-war Little Tokyo with a dramatic shigin, “Fuji-San,” sung by Patrick Seki, president of Kokusouryu Shigin-kai, with Greg Matsuura on shakuhachi. A flute-and-taiko piece entitled “Fugetsu-do” with Rumi Patterson and Shiwei Wu was followed by “Sho Tokyo,” a solo by Yuki Yasuda, master of Ikuta-style Sawai Koto Academy, on koto. Two intricate koto-and-flute pieces featuring Yasuda with Patterson on flute further showcased traditional Japanese instrumentation of that period, putting the audience into an early-Little Tokyo state of mind. Then Japanese Americans were imprisoned in concentration camps during WWII. Many African Americans seeking employment moved into the Southland and into vacant buildings in Little Tokyo, remaining until the war’s end. They brought in the Central Avenue jazz culture. The area became known as Bronzeville and began attracting top jazz names such as Charlie Parker, Miles Davis, Gerald Wilson, Billy Strayhorn. One of Bronzeville’s most famous clubs was Shepp’s Playhouse, one of the “breakfast clubs” open all night for jazz lovers after hours. The Bronzeville Quartet captured the soul and the groove of Bronzeville 1942-45. The proficiency of these jazz musicians, and their commitment to the musical era had people groovin’. Gold Record bassist Henry Franklin’s father Samuel Franklin played with Central Avenue Jazz stars. Franklin has played with numerous jazz musicians such as Freddie Hubbard, Count Basie, Al Jarreau, Roy Ares. Pianist Theo Sanders (Freddie Hubbard, Buddy Collette, Pharoah Sanders) and Don Littleton (Cannonball Adderly, Roberta Flack, Ernie Andrews) were featured when “J-Town/Bronzeville” premiered at the Getty. Louis Van Taylor played saxes and flute. 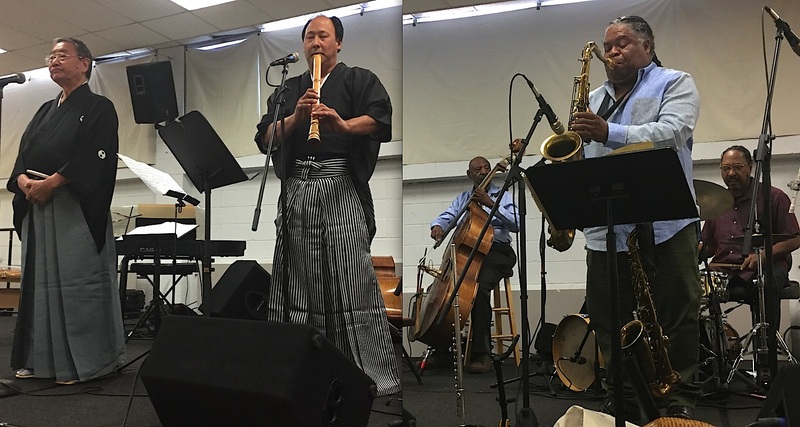 The third movement brought the J-Town/Bronzeville Full Ensemble together to personify post-war Little Tokyo when Japanese Americans were able to come home. The music expressed instances of dissonance, and ultimately the fluid tones of unity. This final movement reflected both the composer’s intent to add another layer viewed through a contemporary lens of race relations today; as well as his love of Japanese culture and jazz, R&B, and Latin music. The musical program was followed by a panel of experts — Dr. Hillary Jenks, Bronzeville scholar; jazz historian Kirk Silsbee; and visual artist Kathy Foley-Meyer — who provided a deeper understanding and appreciation for the period. “I thought Dave’s ‘J-Town/Bronzeville Suite’ was a moving and very cool musical tribute to L.A. Little Tokyo,”exclaimed poet Amy Uyematsu. “It was thrilling to hear a jazz quartet playing with traditional Japanese koto, shakuhachi, and taiko. Both the music and the speakers afterward filled us in on the history of Bronzeville. It was the first time I’d heard of jazz greats Charlie Parker and Miles Davis playing in Little Tokyo.